The life of Owen Meany has many parallels to that of Jesus Christ. Who else is Hester, but Owen’s Mary Magdalene? She has the reputation for promiscuity and a strong devotion to Owen, that leads some to speculate, but as anyone knows, they are not lovers. Another parallel between Owen and Jesus is that, as “The Voice,” Owen preaches against the established authorities and occasionally breaking its laws–and he attacks the hypocrisy of the high priest, the new headmaster of Gravesend Academy, Randolph White. There is much to say about the Owen Meany material in the chapter entitled, “The Voice,” but I thought I would focus my discussion on the interjections of the narrator in this chapter. The first four of these interjections tell a very important story as to the mindset of the narrator. Although the first interjection from February 5, 1987 comments on Liberace’s death specifically, it is important in that it brings up the topic of death in general. On April 19 he recounts the Easter story. And on May 12, Wheelwright’s discussion with Mrs. Brocklebank moves from dandelion removal to the regeneration of starfish. Taken in the context of the preceding entries, aren’t we are really talking about resurrection even if it is only that of starfish? In this chapter, the narrators interjections move from death, through resurrection anxiety, to resurrection itself. This subject is important for anyone who has lost someone important to them, as is the case with John Wheelwright. The later interjections in this chapter are comments on the novels the teacher Wheelwright uses in his English classes. Tess of the D’Urbervilles was written by Thomas Hardy. Fatalism is one of the characteristics of Hardy’s novels in general and Tess in particular. In Tess, fate drives the plot. Tess’s decisions and the events of the early part of the novel begin an irreversible sequence of events. She is powerless to change the trajectory of her life as governed by Fate. The use of F. Scott Fitzgerald’s The Great Gatsby says something about the narrator. The Great Gatsby is narrated by Nick Caraway, who is enamoured with his idol and who is well known for his observations of the events in the novel rather than his participation in them. As with these references to classic novels, the other interjections by the narrator throughout the novel are not without their significance. 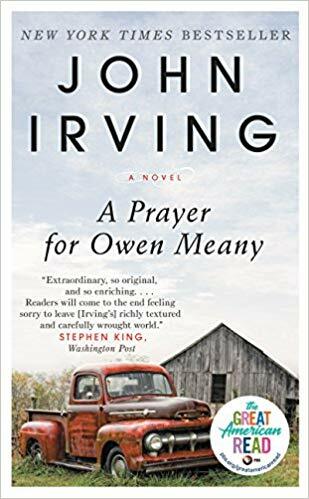 Read the next chapter, “The Dream,” in A Prayer for Owen Meany and then read my commentary here.